Firstly, all this wet weather has meant that most rides have have met with puddles and wet mud, so the bike and clothes invariably gets covered in cack – and much as I like to keep the bike running well, having to do a proper deep clean after every road ride, just isn’t nice. 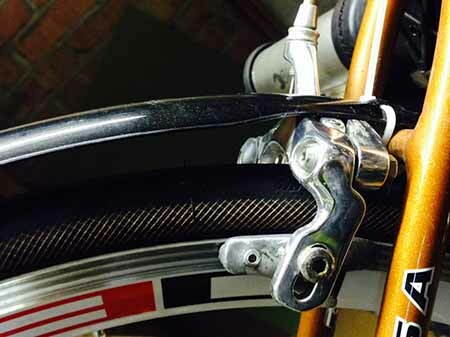 So it would be great to have some sleek effective mudguards and the Crud Road Racers seemed to fit the bill. Hence the order to Chain Reaction earlier this week and the box arriving today. You need to know a little about my bike… I have a Cannondale R700, it’s one of the aluminium CAAD 5 type frames, so holds it’s own in the peloton, but is far from a racing whippet. So I would have expected plenty of room to slide these mudguards into place… how wrong… To be fair, over the winter I’m running 25mm Gatorskins, but they’re not hugely bigger than the normal Rubino Pros, but there’s not enough room to slide the guards under the brake calliper without the tyre rubbing heavily. When I say that the mudguards were rubbing, I’m not talking about one of those annoying taps that has little effect on the rolling resistance of a wheels, but that gets in your head over a ride… the rub with these Crud guards stopped a spinning wheel within a single rotation, it would have been like cycling through treacle! Trust me, I tried every which way to get those guards to fit under the brakes (which are the Cannondale factory units, not disimilar to proper 105s), but there was absolutley no way that they were going in… and that was a tad disappointing given all the hype about them being designed for race bikes. As well as the main mudguard, there’s also an extension that slots down between the seat tube and the wheel, presumably to reduce spray off of the chain set, but that was even tighter. This is far from ideal and I’m feeling like a right old bodge-it merchant and the moral of this story is to get Crud to give some more details to potential users as to whether the guards will work with 25mm tyres, which isn’t going to be an usual situation for most all-season riders. 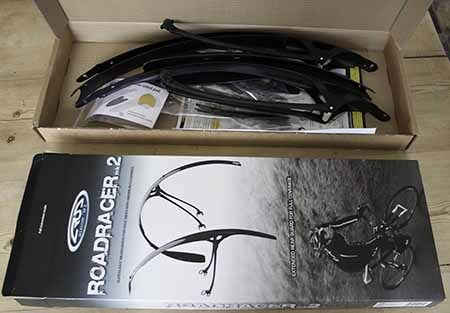 Update 28th Feb 2014 – Having thought this through overnight, I’ve decided to strip the mudguards off the bike and send them back to CRC. They’re £27 and the fit is such a bodge that I’m pretty sure that I’ll be taking them off at some point soon for aesthetic reasons. And they’ll be filthy if I take a few muddy spins to see how they work, so better just to bite the bullet now. Bad luck with the fit. Some manufacturers see fit to have less than 4mm between frame and tyre. This is a ludicrously small gap, and even the RR’s (which take up just 1.5mm) can’t be successfully squeezed in there. Fortunately, with 25mm tyres 95% of the bikes out there have more than 4mm, enabling fitment.